Every iconic recipe has a secret ingredient. Oak & Eden is no different. Actually, maybe we are a little different. Why? Well, we're going to actually tell you about our secret ingredient. Because it's not just a flashy gimmick or trendy play in hopes to satisfy some sort of quick attention. Our secret ingredient is the heart of our whiskey and is the inspiration behind our pursuit to create this incredible whiskey in the first place. So, what is our secret recipe? We call it a spire and it is the single-most symbolic component that defines our culture, our vision for Oak & Eden, and of course, our whiskey. Take a look at the photo above. See that spiral piece of wood inside the bottle, leaning from the bottom-right corner to the top-left corner? That's our spire, and it's got soul. Let's start with a little science lesson, why don't we? The process of distilling whiskey is incredible, and fairly replicable. That being said, it is not an easy process, and every tiny detail of every step of the process will effect the flavor and consistency, which is why there are so many unique and beautiful whiskeys on the market. Whiskey begins with a variety of the following five possible ingredients - barley, corn, rye, wheat, and water. These ingredients are given a distinct ratio to determine much of the flavor profile, and then mixed with water, which then turns into a liquid called "mash". The mash is then put into large tanks where the mash will ferment over the course of about 48 hours. The yeast turns the present sugars into alcohol. The fermented liquid is then poured into a still, which is made of copper, and the liquid is then heated. The heated liquid vaporizes, rises through the neck of the still, and then condenses back into a liquid. This liquid is called low wine. The low wine is then passed to a smaller still, called the spirit still. The same process occurs, except this time, a more refined, purified liquid comes out, which is called high wine. High wine is then poured into oak casks for the maturation process. This is where the whiskey adopts the majority of its flavor. 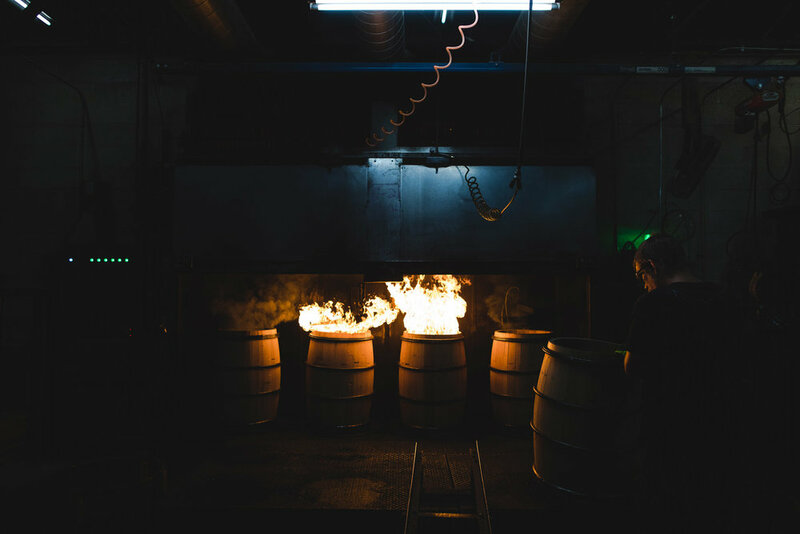 Before the high wine is poured into the barrels, the barrels are first toasted or charred to extract the natural sugars from the wood and to infuse the natural flavors that exist inside the species of the particular wood. Once the high wine goes in, it must rest in the barrel for a minimum of three years. Because wood is so porous, it will expand and contract (or breathe) over time with the shifting of temperature and humidity levels. As this wood breathes, the liquid inside is pushed and pulled to and fro, giving it both its new flavor and color. After three years, it is considered whiskey, however, the longer it rests in its barrel, the more flavor it adopts from the cask, and the more excellent the product becomes. Again, because wood is porous, the longer the whiskey sits, the more it evaporates. A distiller may pursue the perfect batch of 30 year whiskey only to find a dry cask upon its full maturation. You are now qualified to make your own whiskey. Science class complete. 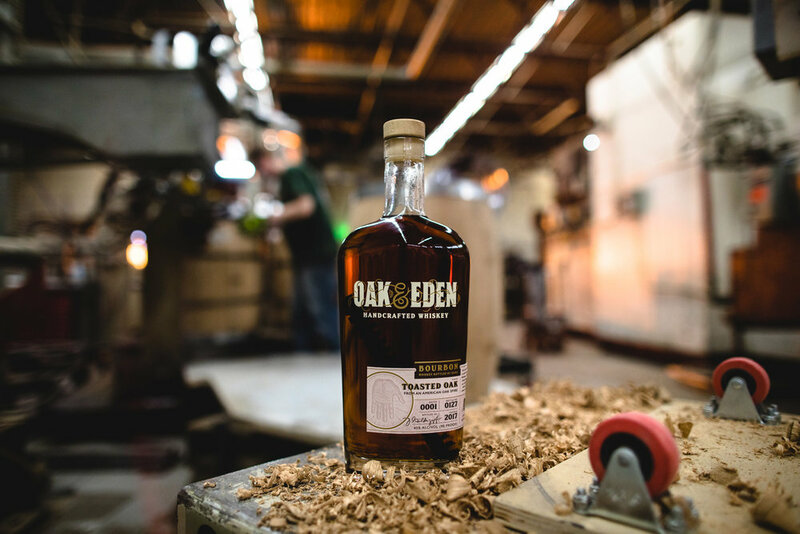 At Oak & Eden, our founders have understood the process of distilling a great bottle of whiskey for years and have also recognized the value of testing new methodology, experimenting with new techniques, and ultimately have always sought after innovative ways to advance the flavor of whiskey after it finishes resting in its original cask. Many people are familiar with the process of distilling and maturing whiskey, but very few people are familiar with the concept of finishing whiskey. Here's how it goes. Finished whiskey, or double matured whiskey, is a procedure that some whiskeys undergo whereby the spirit is matured in a cask of a particular origin and then is transferred (or finished) in a cask of different origin. Typically, the first cask is an American oak cask formerly used to mature bourbon. The second cask may be one that has been used to mature some sort of fortified wine, beer, rum, or virtually any other consumable alcohol that can introduce new flavors to the whiskey beyond its original profile. This concept led our founders, Joe and Jamie, to test out new concepts in which they could finish whiskey in a way that is both innovative, yet also makes the profile of the whiskey significantly better. After months of research and product design, they kept coming back to a concept called "in-bottle finishing". Rather than a whiskey being immersed into a cask and finished for a limited time period, the idea was to immerse the cask into the whiskey for an indefinite time period, and ultimately continue the finishing process as long as the cask rests in the bottle. Herein lies the problem: how does one put a cask into a bottle of whiskey? One epiphany led to another, and the concept of the spire was born. We began seeking a partnership with a cooperage to help us engineer this spire and to ensure that it not only worked conceptually, but was also a sustainable idea scientifically. 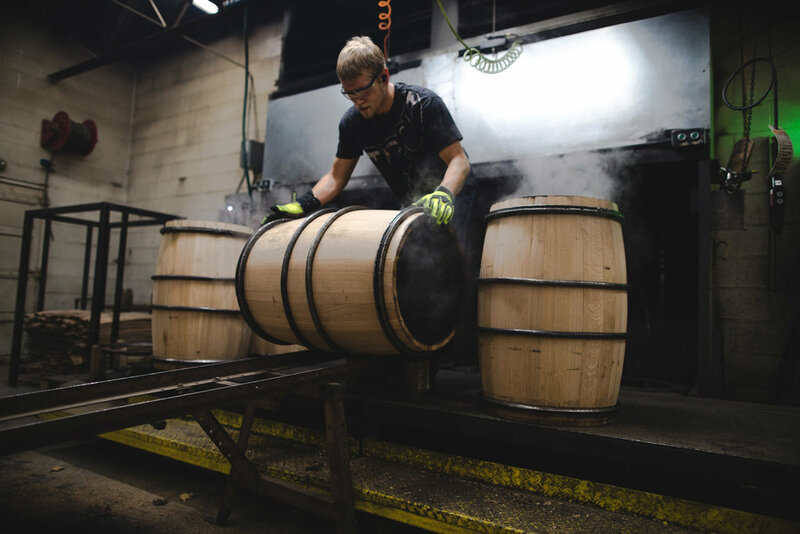 We landed on a cooperage based in Avon, MN called The Barrel Mill, and our concept became reality.. So, what exactly is the Oak & Eden spire? It is a 5" long spiral of wood, cut from the cask of an oak barrel that has previously matured a spirit of a different origin than that of the whiskey it will be immersed in. For instance, it could be a spire cut from a French Oak cask that has aged a cabernet. Or it could be from an American Oak cask that has aged rum. Once the spires are cut, they are then toasted or charred to various degrees in order to extract different and unique flavors from the whiskey. For instance, if a spire made from an oak is lightly toasted, it mellows the tannins in the wood and extracts the natural sugars to impart spicy, vanilla note. A charred wood, however, ends up becoming a sort of activated carbon filter, which can help remove sulfur compounds from the whisky, and make a smoother drink, imparting flavors of caramel, honey and plenty of spicy accents. Because our spires are cut from barrels that were previously used to used a spirit of a different origin, not only does the toasting or charring of the wood have an impact on the flavor profile, but possibly the most notable flavor addition comes from the infusion of the second spirit. While it is never overpowering, introducing characteristics of this additional spirit allows for the whiskey to adopt new traits that enrich the already beautiful flavor and color of the whiskey. Let's get technical for a moment. We have designed the spire to be 5" in length and 1" in diameter. The surface area of the spire according to the volume of whiskey in a bottle of Oak & Eden is substantial and can finish a whiskey faster and more precise than finishing it in any cask. Why? Fairly simple science. If a whiskey is to rest inside a cask, the only whiskey that is truly finishing and adopting the flavors of the resting cask is the whiskey that is physically touching the inner surface area of the cask itself. This means that only a very small percentage of the whiskey in the cask can be finishing at any given point in time. When you infuse a spire into a bottle of whiskey, which makes up almost 20% of the surface area of the whiskey in the bottle, but has a 360° coverage, the whiskey can finish nearly 3x as fast, and can also continue finishing the whiskey as long as it remains inside the bottle. Can the spire transfer to finish even another spirit? Absolutely! This is actually one of the hopes we had when creating the spire. Let's say you enjoy our Limited Edition bottle of Cabernet Steeped whiskey, which is a blended whiskey that has been finished by a French Oak spire that has previously aged a cabernet. You may want to experiment with other spirits on your own, infusing this spire into into a bottle of rum, vodka, or even beer. The experiments are endless.